If we are what we eat, Americans are hot dogs. We ate them on the way to the moon and served them to the king of England. We name a Hot Dog? Eating Champ! Garnished with hilarious illustrations and amazing ?foodie? facts, this kid-friendly, globespanning history of our favorite fast-food meal offers unique insight into America?s multicultural heritage. From a hobo?s franks If we are what we eat, Americans are hot dogs. We ate them on the way to the moon and served them to the king of England. We name a Hot Dog? Eating Champ! Garnished with hilarious illustrations and amazing ?foodie? facts, this kid-friendly, globespanning history of our favorite fast-food meal offers unique insight into America?s multicultural heritage. 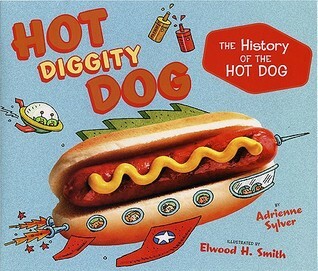 From a hobo?s franks-and-beans to astronaut food, there?s more to the wiener?and what?s for dinner?than you think.